Strategized with colleagues on material to present the Canadian Seed Traders Association on Roundup Ready alfalfa and the impossibility of a “co-existence” strategy. Monsanto has an agenda to push RR alfalfa into the Canadian market through Ontario and Quebec. This strategy takes some level of national pressure off of Manitoba Forage Association on this issue. Co-existence has become code word for “set acceptable contamination targets” and OCO is working hard to ensure we communicate the impossibility of containing RR alfalfa and the impact on all of agriculture. Consultations with OCO members and with partners at Sustain Ontario to determine what policy position Sustain Ontario might take regarding small flock exemptions for chickens. The issue is the current system is out of line with other regions in Canada (which allow for flocks 50-300 times larger than allowed under current rules in Ontario) and our producers do not have consistent, transparent rules for accessing small flock quota. Completed draft of Local and Organic Communications Key Messaging. This document will provide guidance for developing materials for local and organic producers to use in their communications efforts to help clarify what people “get” when they choose local and when you choose organic. Met with OMAFRA to discuss the need for a CSA (Community Shared Agriculture) conference. Continued work on the Import Replacement Strategy and the Alternative Investment report for our “Producer-Consumer Engagement Strategy” project. Met with Lead Researcher Theresa Schumilas to review Fact Sheets on the state of Organic in Ontario. Attended the COTA sessions at the CHFA Expo East; distributed our new “Rally with OCO For an Organic Ontario” materials at the CHFA Expo. Confirmed our keynote speaker, Julie Daniluk, for the Hart House Dinner and Jazz Night. Met with Ontario Agri-Food Education to discuss improving and creating resources on organic careers, production and approaches within the K-12 curriculum. OAFE is a registered charity that distributes educational materials to Ontario grade school and high school teachers. Much of their current offerings are developed by Chemical Ag giants like Cargill. 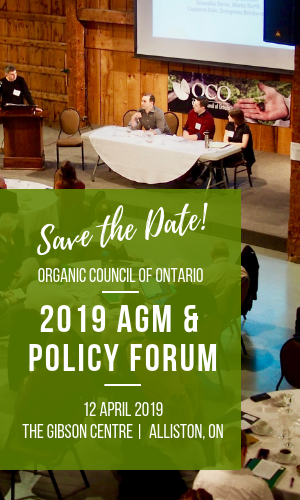 OAFE is interested in “getting it right” about organic, and we are excited about our new relationship with OAFE. First action item is an invitation for OCO to critique current materials for inaccuracies and work together to develop materials about career options in organic agriculture for high school students. Met with Christie Young at FarmStart to discuss Alternative Financing study for local and organic farmers.